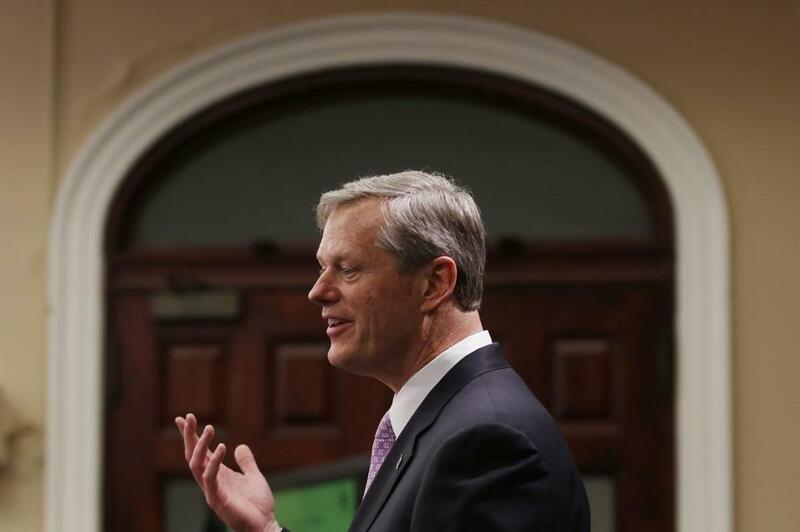 Governor Charlie Baker’s fiscal 2020 budget included an overhaul of state funding for school districts. Governor Charlie Baker’s new education proposal would expand the power of the state to intervene in struggling schools, opening up a major front in the coming Beacon Hill debate over how best to revamp the state’s troubled school funding formula. Teachers and other education advocates slammed Baker’s plan, which includes enabling the commissioner of the Department of Elementary and Secondary Education to withhold some state aid from school districts if the department determines they aren’t making necessary changes to improve student performance. “We find that appalling, to withhold funds from some of our neediest districts . . . in order to impose whatever plan the commissioner feels [is] best,” said Max Page, vice president of the Massachusetts Teachers Association, the state’s largest teachers union. “His proposal to take resources away from K-12 students whose schools are struggling, when those are clearly the communities that need the most help, is simply nonsensical,” said Lisa Guisbond, a member of the Fund Our Future coalition, which includes teachers unions and other advocacy organizations. Baker administration officials describe the expanded powers for the commissioner, a position currently held by Jeffrey Riley, as another tool to close the achievement gap that has opened up between students in the state’s poorer districts and those in richer suburban areas. “What we tried to do here was create an appropriate way for the commissioner — a guy who really knows how to turn around these kind of schools and districts and has proven it for the past 25 years — to create a process that can bring both his knowledge and the knowledge of others, as well as some focus and urgency, into dealing with” schools that continue to stumble, Baker continued. Baker’s education bill would give the commissioner more power to approve and shape certain measures in the schools’ formal turnaround plans — which are three-year road maps officials at underperforming schools must formulate to improve performance. The Baker bill also proposes that if the commissioner finds at the end of that first three-year plan a school hasn’t taken key steps it was supposed to, he can withhold some state aid until the school follows through. “At the end of the day, it’s really designed to never be used but to provide the kind of influence or leverage the commissioner — or for that matter the superintendent — may need in order to get stuff done,” James Peyser, Baker’s education secretary, said in an interview. Administration officials stress that the money involved is administrative funding for staff, and wouldn’t come out of school budgets or money that directly serves students. Baker’s bill contains carrots to help struggling schools that Peyser said could be used in conjunction with a threat of withholding funds to push a school to adopt changes the commissioner believes are necessary. These include a new $50 million “school improvement” fund, money the commissioner can give to troubled schools to fund specific performance-boosting initiatives, such as after-school programs. Page, the teachers union official, contended the provisions are part of a broader effort by the Baker administration “to centralize power over school districts in the Department of Elementary and Secondary Education.” His group fears Peyser and Riley will use it as a “weapon” to force school districts to accept changes, such as more charter school seats, that the union believes the local communities don’t want. Other advocates want to see even more strings attached to the new infusion of money pitched in Baker’s proposal. A final bill should include some mechanism to measure that money is actually being spent to close the achievement gap, said Edward J. Lambert, executive director of the Massachusetts Business Alliance for Education, which played a key role in the landmark 1993 law that established the state’s current education funding formula. 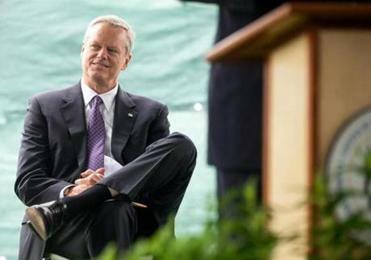 Baker’s education bill, unveiled Wednesday alongside his fiscal 2020 budget proposal, helped define the contours of another central aspect of the funding fight — just how much more money the state should spend. Baker’s proposal envisions the state and municipalities together spending $1.1 billion more on educating K-12 students at the end of the seven-year ramp-up period. Administration officials said they did not have an estimate of how much the state aid would increase, but historically the state portion of the foundation budget has run about 45 percent, according to Peyser. By contrast, a bill introduced earlier this year by state Senator Sonia Chang-Díaz and Representative Aaron Vega would increase the state portion alone by more than $1 billion at the end of a multiyear phase-in, according to aides. Numerous players, including the teachers unions, are backing the Chang-Díaz bill and its higher spending levels, and even advocates who haven’t endorsed it believe more funding than Baker has proposed is likely needed . “Teachers and students have already been doing our part. We’ve been testing and we’re doing all these things that are our accountability measures. Now what we need really is for the state to do their portion . . . and that is our funding,” said Beth Kontos, president of the American Federation of Teachers in Massachusetts. Another unknown factor is where House leaders will come down on the key questions, including how much state money to commit to struggling schools and what strings to attach to that cash. Saying he’s yet to look at all the details of the 14-page bill, House Speaker Robert A. DeLeo declined Thursday to address Baker’s proposal. He also was noncommittal on the specific provision to withhold funding earmarked for administrative needs. “At the end of the day, I’m not sure if that will be part of our particular piece of legislation,” DeLeo said, adding he’d have to speak to various players.